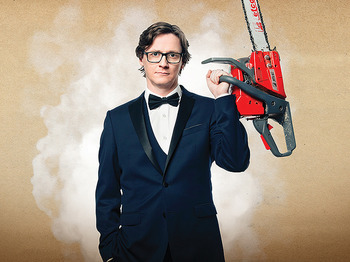 Irish comedian, Ed Byrne, made a stop in Middleton, north Manchester, last night as he continues a lengthy three month tour with his latest show, Spoiler Alert. Perhaps more famous as a contestant on TV panel shows such as Mock The Week, Byrne is actually a very versatile comedian, who also acts and writes, presents TV documentaries, and also works as a voice-over artist. Spoiler Alert, like the vast majority of Byrne's comedy, is based on observations, and this evening it was modern life and his family who bore the brunt of his acerbic material. He tells briefly of his upbringing in the 70s, and compares this to how he, and all other parents spoil their children, who have everything handed to them on a plate. His anecdotes about the electric fence and him running out of petrol were especially funny. Surprisingly really I suppose, but underlying the comedy, Byrne was actually quite serious, and his message to us all was clear; that we live in a country and at a time when we are completely spoilt. Life is cosseted to such an extent that we can choose which news we wish to read - even the truths that surround us are made to measure. A rather sobering thought for a comedian to make, but it hit home, and with Byrne's rather manic and seemingly disorganised ranting style, it was also very funny. Now here comes the rub. Byrne's act started at 9:20pm. Before this we had 'filler material' provided first of all by Byrne himself who introduced his own support in a very unrehearsed and impromptu way (using far too many expletives for anyone anywhere! ), and then we had to listen to another comedian for the remainder of the first half, and then come back to him for a few minutes after the interval before being able to enjoy what we had come to see. The comedian in question was Canadian Paul Myrehaug, who was rather laconic and laid-back. A totally different style from Byrne, but surprisingly their materials touched on similar topics. However, Myrehaug did not particularly impress, but I did enjoy his anecdotal style. His niece eating salmon and thinking it was dragon meat was a lovely story, and I really do hope that it is true. And his joke about Canada taking the best from both England and France was quite funny. This is something I simply fail to understand. Why do comedians, musicians, bands, singers etc, feel the need when they tour to take unknown or comparatively unknown acts of a similar vein with them? There are only two reasons I can think of why this might happen. Firstly, the main artiste doesn't have enough material of their own to fill a whole evening; and secondly, the main artiste hasn't got enough confidence or self-esteem to think that they could possibly command an audience for such a long time. Neither of these statements could surely apply to Byrne. He is well-known and extremely capable. He can command a room and has the charisma and intelligence to do the whole evening himself, surely? This is a huge, albeit back-handed, compliment to Byrne of course. Spoiler Alert continues touring until December 13th. For venues and details please see www.edbyrne.com; and if you do go, take a packet of chocolate Hob Nobs for Byrne!